The introductions of the Chevy Volt and Nissan LEAF in 2010 marked the beginning of a new era in the transportation industry: the permanent establishment of electric-drive in the mass market for passenger vehicles. Ever-rising and increasingly volatile oil markets and better energy storage technology have suddenly brought electric vehicles (EVs) to the threshold of technical and economic viability. Car manufacturers have begun to take a new interest in EVs, spurred by governments’ attempts to reduce energy dependence and the environmental footprint of the transportation sector. This report is a comprehensive account of the strategic opportunities created by the electriﬁcation of personal transport. It offers an extensive review of the technological, economic, and political trends shaping the EV industry. By investigating supply and demand drivers, it analyzes the industry trajectory for the next ﬁve years. The report relies on supply and demand analysis to assess industry growth and explores how the supply and demand dynamics are impacted by preferences and biases. 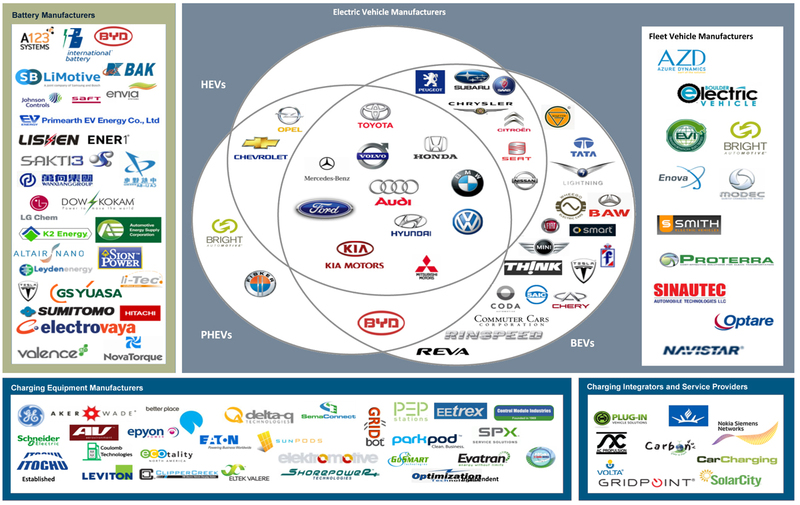 Growth analysis and investment flows for global EV market through 2015. Breakdown of current EV economics and opportunities for reducing capital, battery and EV operating costs. Examination of supply-side manufacturer capacities and constraints to growth.